Michael J. Hultquist’s novel, HUFFER, simply blew me away. When “Satan” appears to Gus Gerring as a tourist wearing a Hawaiian shirt, it might have very well been a hallucination brought about by Gus’s favorite past-time, huffing paint. His girlfriend thinks so too. When he starts seeing the darkness inside of other people, a so-called “gift” from his Satan, he starts to question. Who wants to see “what evil lurks in the hearts of men?” Not I, and not Gus either, because as his Satan’s gift makes it’s presence known in his friends and family, his mind starts spinning –and not from the paint fumes either. I liked the novel, but it took me a while to get in to the story due to my own personal opinion of huffing paint. Sometimes it can be difficult to overcome one’s own biases, but for this novel, it’s worth it. Told in present tense from Gus’s perspective, HUFFER gave me the chills as though the man was telling me his story, standing in front of me. Gus feels like an unlikely hero from the start, but Michael Hultquist does an excellent job of providing a natural storytelling voice. I’ve fallen behind on reading submissions, it’s pretty chronic actually, and reached the point where I’ve thought about bringing in a slush reader or two to help speed up the process. The best way for me to do that is to begin using a submissions service/system that requires creating an account and logging in to submit rather than continuing to accept submissions through email. Some people don’t like creating accounts / signing up to websites to submit. You tell me, if it would speed up the rate at which your work would be considered and responded to, would you be willing to create an account to submit to Niteblade? One of the perks to doing interviews with authors for Niteblade is learning about their work and sharing it with you. 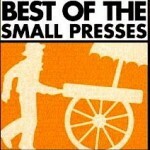 Today, Niteblade readers, is a lighthearted interview with Jeremy C. Shipp. 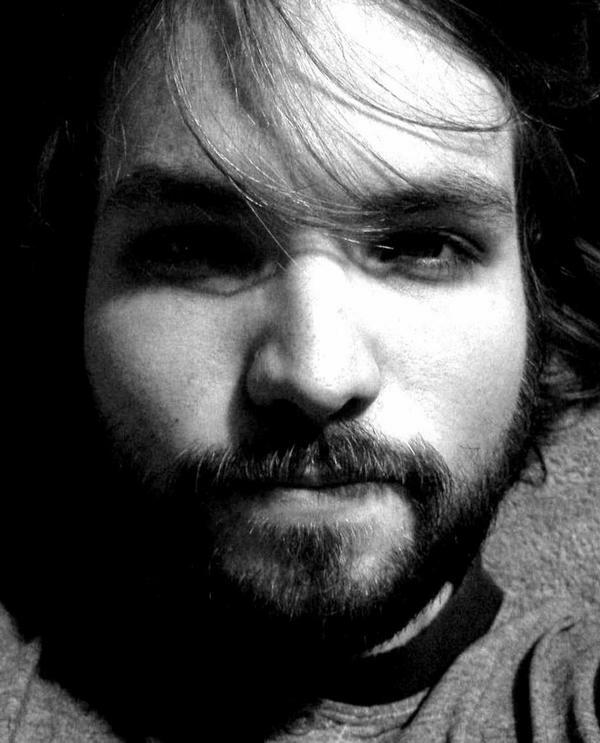 Jeremy is a Bram Stoker Award nominated author. He lives in Southern California and his newest book, Fungus of the Heart, went on sale this month. You’ve been writing novels since you were 13 and had one of your short stories published when you were 18. Do you remember when you first considered yourself a writer? In 2009 you received a Bram Stoker Award nomination with your novel, Cursed. Writers often work in vacuums and don’t always hear from their readers. Was it validating to be nominated by your peers? It was definitely a touching moment in my career to be honored by my fellow horror writers. I was as excited as Atreyu when he rode Falkor for the first time. How do you pick the titles for your books? First I pull Scrabble tiles out of a magic yard gnome hat and use those letters to come up with possible titles. After that doesn’t work, I put on my thinking cap and come up with an appropriate title. 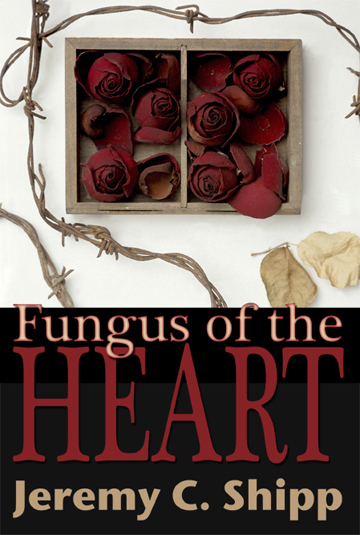 I ended up using “Fungus of the Heart” as the name of my newest book because I find the image and concept to be emotionally evocative and thematically fitting. I understand your newest collection of short stories, Fungus of the Heart, goes on sale this month. Did you write the stories specifically for the collection or did you select them because they were connected in some way? I wrote most of the stories with the collection in mind. I also included three older tales that meshed well with newer stories. Each story in this collection is a unique world, but the worlds are all orbiting the same thematic sun. And while that doesn’t make any sense, it’s true. I’m writing a middle grade fantasy novel as well as a new horror story collection. There’s also a musical stage play in the works based on my short tale “Nightmare Man.” In addition, I’m trying to build a giant robot that looks like Mr. Belvedere. I can’t remember why. You live with yard gnomes and attic clowns. Do you ever think they will wage a war for more territory? Attic clowns find war to be hilarious, and they might attempt to kill all the yard gnomes in my garden as a joke. However, the gnomic shamans wield magical sporks that can transform clowns into Skittles. And so, the war wouldn’t last very long. Is there anything else you’d like to share with our readers about Fungus of the Heart or your other works? In Huffer by Michael J. Hultquist, Gus Gerring has a paint-huffing habit. He’s finds he’s been at the fumes for too many years when an entity Gus calls “Satan” shows up in a Hawaiian shirt. Soon, he’s revealing things Gus doesn’t want to know. Gus sees strangers’ eyes turn black. Then his loved ones have the same black eyes. It gets worse when he sees the insidious secrets inside people’s minds and too much to take when he sees the hidden evil in his own girlfriend and family. With his sanity at stake, Gus wonders if this is a gift meant to enhance his life like “Satan” says or a curse meant to destroy him. The way his life’s spiraling out of control, he’ll soon find out. 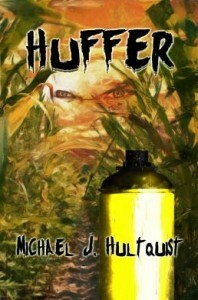 Huffer by Michael J. Hultquist is a scathing horror novel that caught my attention from the beginning and held me captive throughout the whole book, making me fear I’d get his power. The story is wonderfully woven through realistic events in Midwestern Illinois that could happen to anyone. I recommend this book without a second’s hesitation. If Huffer doesn’t freak you out, you haven’t got a pulse. College student April doesn’t know much about Tam – but when his life is in danger from an invisible enemy, April is drawn into his world and joins him on a road trip across the state of California to dodge death from a shadow. Tam doesn’t know anything about April, but ends up relying on her as a means of escape from the creature that wants to destroy and become him. If Tam thinks he’s finally escaped his mother’s grasp, he’ll soon find out how wrong he is. The world of Shadow of the Antlered Bird is one of magic hidden beneath the veneer of technology. It is also a story of discovery for not only Tam and April but also for readers discovering how science and spells can seamlessly synthesize in the hands of a talented storyteller. 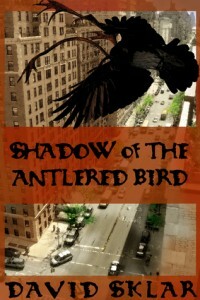 David Sklar’s premiere work, Shadow of the Antlered Bird, should make readers excited for his next writing projects. His writing is tightly contained yet manages to weave in great amounts of detail and imagery in a modest amount of pages. The dialogue is fresh and rolls naturally from the characters’ mouths even as the situation becomes more and more bizarre. It is a beautifully put together book of fantasy and drama told by a very human cast of characters that will enthrall every reader completely. 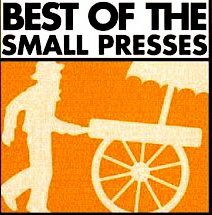 Niteblade is proud to announce our Pushcart Prize nominations, as chosen by Rhonda Parrish. Congratulations to all our nominees. We wish you the very best of luck.